FCPO February futures contract close at RM1660 ; surge RM62 higher as compare to previous trading session with a total of 5860 lots traded in the market. CPO price was traded higher during trading session due to firm overnight Crude Oil closing above USD50/barrel. Technically, CPO price was still seen riding on a short term bull rally and manage to breach short resistance levels at RM1655 region. We expect CPO price would be traded higher towards next resistance levels at RM1704 and RM1770 region provided support levels at RM1650 and RM1600 region were not violated. Traders were advice to hold long position once CPO price was standing firm above resistance levels. Provided critical resistance level at RM1723 was violate, we expecting CPO price would be trading towards at least RM1770 level in the coming trading session. FKLI November futures contract close at 873.5; 4.5 point higher as compare to previous trading session with a total of 9527 lots traded in the market. FKLI was traded higher due to Dow Jones overnight firm closing and regional indices encouraging price movement. Technically, FKLI was seen temporary support at 866 regions for short term trading and seems holding well above the resistance trend line at 860 regions. We expect FKL would be trading higher in the coming trading to complete wave 5 projected around 940 regions. Traders were advice to hold long position in the coming trading session provided support levels at 866 and 850 levels were not violated. 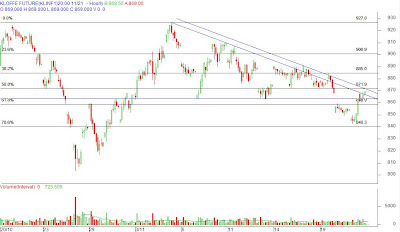 Resistance levels were seen at 890.5 and 910 region. NEW DELHI, 26 Nov (Reuters) - India will only impose an import tax on crude palm oil if there is a further drop in local oilseed prices, the farm minister said on Wednesday, despite trade calls for a duty to protect farmers and domestic rates. "The government will act if (oilseed) prices fall below government's minimum support prices," Sharad Pawar said. JAKARTA, Nov 26 (Reuters) - Indonesia is maintaining its zero percent palm oil export tax in December, while it has cut the December palm oil base export price to $415 a tonne from $573, the trade ministry said on Wednesday. The moves are effective from Dec. 1. CPO price starts to surge up during 2nd trading session after crude oil and soybean oil electronic trading traded higher hence induce CPO to move upwards. Technically, CPO price starts to surge up once manage to breach resistance levels at RM1550 region. We expect CPO would be trading around RM1790 region in the coming trading session. traders were advice to hold long position in the coming trading session around the support levels at RM1550 and RM 1500 region while be cautious around resistance levels at RM1596, RM 1647 and RM1690 region. FKLI November futures contract surge 15 point higher compare to previous trading session to close at 869 with a total of 12689 lots traded in the market. FKLI was mainly traded sideways but starts to surge up before closing despite regional indices and Dow Jones electronic trading was not trading higher significantly. Technically, FKLI price breach uptrend resistance lines to close at 869 but still yet to breach resistance levels at 871 region. traders were advise to ONLY hold long position provided if resistance levels at 871 and 886 were violated in the coming trading session. However, supports were seen at 850 840 region respectively. Nov. 26 (Bloomberg) -- Gold fell for the first time in six days, halting the longest rally since July, as a rebound in the dollar slashed demand for the precious metal as an alternative investment. Silver and platinum fell. The U.S. currency jumped as much as 1.9 percent against the euro today. Gold often moves in the opposite direction of the dollar. The metal has dropped 3.2 percent this year as the dollar gained 13 percent versus the euro. Gold futures for February delivery dropped $9.20, or 1.1 percent, to $811.30 an ounce on the Comex division of the New York Mercantile Exchange. The metal touched a record $1,033.90 on March 17. Gold rose for five straight sessions through yesterday, the longest rally since July 15. Gold also fell today as investors sold the metal after prices surged 12 percent in the previous five sessions, Selkin said. The metal’s seven-day relative strength index, a measure of how fast prices have moved, jumped to 78.5 yesterday. Readings higher than 70 signal prices may be poised to drop. The losses for gold may be limited as crude-oil prices move higher, increasing demand for the metal as a hedge against inflation, said Ron Goodis, a retail trading director at Equidex Brokerage Group Inc. in Closter, New Jersey. Crude oil on the Nymex added as much as 6.1 percent today. Some investors buy precious metals to preserve purchasing power as higher energy prices increase consumer costs. “Inflation will continue to make gold bullish,” Goodis said. Silver futures for March delivery lost 3.6 cents, or 0.3 percent, to $10.27 an ounce on the Comex. Platinum futures for January delivery fell $1.90, or 0.2 percent, to $869.70 an ounce on the Nymex. Palladium for March delivery lost $6.05, or 3.1 percent, to $191.65 an ounce. Both metals are used to make car-pollution control devices. Johnson Matthey Plc, the producer of a third of all catalytic converters, said second-half earnings will be 5 percent to 15 percent lower than a year earlier as car sales slump. Automakers account for more than 60 percent of global platinum consumption, according to the company. Nov. 27 (Bloomberg) -- The yen may advance for a third against the euro and rise versus the dollar on speculation a global recession will spur investors to pare holdings of higher- yielding assets funded in Japan. The yen strengthened versus the South African rand before data that may show money-supply growth and inflation are slowing in Europe, giving the European Central Bank more scope to reduce interest rates. Reports yesterday showed U.S. consumer spending, durable-goods orders and new-home sales fell last month as the global financial crisis damped consumption. The yen traded at 95.56 per dollar as of 8:46 a.m. in Tokyo from 95.67 late yesterday in New York. Against the euro, it was at 123.20 from 123.24. The euro was little changed at $1.2888 from $1.2880. The yen may gain to 121.90 versus the euro and 94.80 against the yen today, Amikura said. M3 money supply, which the ECB uses as a gauge of future inflation, slowed to an 8.1 percent gain in October from an 8.6 percent increase the previous month, according to a Bloomberg survey of economists before the data is released today. Consumer prices in the 15 countries that share the euro rose 2.4 percent in November, slower than a 3.2 percent gain the previous month, a report tomorrow may show. U.S. consumer spending, the biggest contributor to the economy, fell 1 percent last month, after dropping 0.3 percent in September, the Commerce Department reported yesterday. New- home sales in the U.S. fell to an annual pace of 433,000, the lowest level in 17 years. Orders for long-lasting goods declined 6.2 percent, following a 0.2 percent decrease in September. The Federal Reserve committed up to $800 billion on Nov. 25 in new funding to thaw credit flow for homebuyers, consumers and small businesses. The ICE’s Dollar Index, which tracks the greenback against the euro, the yen, the pound, the Canadian dollar, the Swiss franc and Sweden’s krona, rose 0.8 percent to 85.667 yesterday. The index climbed to 88.463 on Nov. 21, the highest level since April 2006. Nov. 27 (Bloomberg) -- Crude oil was little changed after rising yesterday when China, the world’s second-biggest energy- consuming country, cut interest rates by the most in 11 years to boost economic growth. Chinese fuel demand has fallen “sharply” since September because of credit-market turmoil, the country’s biggest oil producer, China National Petroleum Corp., said Nov. 17. Prices also climbed after a government report showed that U.S. fuel use climbed 510,000 barrels to 19.5 million barrels a day last week. Crude oil for January delivery rose 1 cent to $54.45 a barrel at 10:35 a.m. Sydney time on the New York Mercantile Exchange. Futures have dropped 63 percent since reaching a record $147.27 on July 11. Yesterday, crude futures increased $3.67, or 7.2 percent, to settle at $54.44 a barrel. Markets in the U.S. will be shut today because of the Thanksgiving holiday. Shorts are bets that prices will fall. China lowered interest rates for the fourth time in 10 weeks, extending efforts to prevent an economic slump less than three weeks after unveiling a 4 trillion yuan ($586 billion) stimulus plan. The one-year lending rate will drop 108 basis points to 5.58 percent, the People’s Bank of China said on its Web site. The European Union proposed measures totaling 200 billion euros ($259 billion) and said more may be needed to limit the impact of the global financial crisis. Paul Volcker, the former Federal Reserve chairman who throttled the economy to crush inflation in the 1980s, will lead a new White House panel aimed at reviving growth, according to Stephanie Cutter, transition team spokeswoman for President- elect Barack Obama. Crude-oil supplies rose 7.28 million barrels to 320.8 million barrels last week, according to the Energy Department. It was the ninth-straight increase, the longest stretch since April 2005. Stockpiles were forecast to climb 1 million barrels, according to the median of 14 analyst estimates in a Bloomberg News survey. Crude oil demand may climb as refineries boost processing. Refineries increased operating rates by 1.3 percentage points to 86.2 percent of capacity, the highest since September. A 0.1 percentage-point gain was forecast. Gasoline inventories rose 1.84 million barrels, or 0.9 percent, to 200.5 million barrels, the department said. A 500,000 barrel gain was forecast, according to the survey. Gasoline for December delivery yesterday climbed 8.49 cents, or 7.8 percent, to $1.1798 a gallon in New York, the highest settlement since Nov. 14. It was the biggest one-day gain since Nov. 4. The Organization of Petroleum Exporting Countries, which controls more than 40 percent of the world’s crude, is due to meet in Cairo on Nov. 29. OPEC nations may cut output for the second time in as many months as recessions in the U.S. and Europe drag oil below $50 a barrel. Last month, they agreed to cut production by 1.5 million barrels a day. Venezuela will support an output cut of “at least” a million barrels a day at the next OPEC meeting, Energy and Oil Minister Rafael Ramirez said. The group will evaluate compliance with the cut agreed to last month, Ramirez told reporters before a trade summit in Caracas. Merrill Lynch & Co. cut its 2009 oil price forecast to $50 a barrel from $90 on speculation OPEC is powerless to support the market, as fuel demand shrinks amid a global economic slump. The bank lowered its 2010 forecast to $70 a barrel from $100. Brent crude oil for January settlement increased $3.57, or 7.1 percent, to settle at $53.92 a barrel yesterday on London’s ICE Futures Europe exchange. FCPO February futures contract rose RM32 higher compare to previous trading session and close at RM1520 with a total 5342 lots traded in the market. CPO price was traded higher during trading session due to strong soybean oil and crude oil overnight trading. Technically, CPO price was seen temporary supported above 23.6% Fibonacci retrace figure at RM1512 levels after tested resistance level at RM1550 region. We expect CPO price would traded higher in the coming trading session towards RM1770 region provided support levels at RM1422 and RM1450 level were not violated. Resistance levels were seen at RM 1550 and RM1600 regions. FKLI November contract raise marginally 3 points higher compare to previous trading session at 854 with a total of 15273 lots traded in the market. FKLI fails to uphold buying momentum during morning trading sessions and later retrace toward previous trading session closing due to weak regional and Dow Jones futures electronic trading. 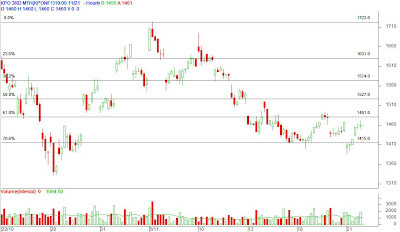 Technically, FKLI seems temporary supported above 850 and 840 regions; 78.6% Fibonacci figure. 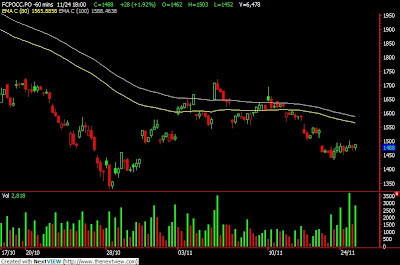 We expect FKLI would surge in the coming trading provided if support levels were not violated. Traders were advice to ONLY hold long position once resistance levels at875 and 884.5 were breach. Nov. 25 (Bloomberg) -- Gold futures rose for a fifth straight session, the longest rally since July, as a decline in the dollar boosts the appeal of the precious metal as an alternative investment. Platinum also gained, and silver fell. The dollar dropped for a third session against the euro after the Federal Reserve pledged $800 billion to help ease the credit crisis for homeowners, consumers and small businesses. Gold and most metals often move in the opposite direction of the U.S. currency. Before today, gold fell 2.1 percent this year as the dollar rallied 11 percent against the euro. Gold futures for February delivery rose 10 cents to $820.50 an ounce on the Comex division of the New York Mercantile Exchange, after earlier touching $834.50. The price climbed 12 percent since Nov. 18, the longest rally since the five days ended July 15. Silver futures for March delivery fell 7.3 cents, or 0.7 percent, to $10.305 an ounce on the Comex, after earlier rising to $10.60. The metal rose 15 percent the previous two sessions. Platinum futures for January delivery rose $5.20, or 0.6 percent, to $871.60 an ounce on the Nymex. Palladium for March delivery climbed 80 cents, or 0.4 percent, to $197.70 an ounce. The dollar fell as much as 1.2 percent against the euro and 1.5 percent against a weighted basket of six major currencies. Since the second quarter of 2007, banks worldwide have posted $971.2 billion in losses and writedowns related to the credit crunch. The U.S. has already committed $700 billion to help bail out banks. Fed policy makers have also lowered the benchmark interest rate to 1 percent from 5.25 percent in September 2007. Still, gold’s gains were limited as some investors sold the metal after four straight days of gains. The metal earlier rose to the highest since Oct. 16. The seven-day relative strength index for gold has been above 70 for the past three days, a signal to technical traders that prices are headed lower. Gold reached a record $1,033.90 on March 17 after Bear Stearns Cos. agreed to be purchased by JPMorgan Chase & Co. to avoid collapse. The metal dropped as low as $681 on Oct. 24 as the unfolding credit crisis forced some investors to sell the metal to raise cash and cover losses in other markets. Before today, the Standard & Poor’s 500 Index has lost 42 percent this year. Nov. 25 (Bloomberg) -- Crude oil fell on speculation that a U.S. Energy Department report will show that inventories climbed for a ninth week as demand declined. A report tomorrow will probably show that supplies rose 1 million barrels last week, according to a Bloomberg News survey. Fuel demand during the four weeks ended Nov. 14 was down 7 percent from a year earlier, the department said last week. Oil rose more than $4 a barrel yesterday, following equities higher. Crude oil for January delivery declined $3.73, or 6.8 percent, to settle at $50.77 a barrel at 2:42 p.m. on the New York Mercantile Exchange. Futures have dropped 66 percent since reaching a record $147.27 on July 11. Prices surged yesterday after the government gave Citigroup Inc., the second-biggest U.S. bank by assets, $306 billion of loan guarantees over the weekend. The U.S. economy in the third quarter shrank faster than previously estimated as consumer spending fell the most in almost three decades. Gross domestic product contracted at a 0.5 percent annual pace over the period, the most since the 2001 recession, the Commerce Department reported today. The U.S. consumes 24 percent of the world’s oil. Gasoline inventories probably increased 500,000 barrels from 198.6 million barrels the week before, according to the median of 15 responses in the survey. Analysts were split over whether stockpiles of distillate fuel, a category that includes heating oil and diesel, rose or fell. The department is scheduled to release its weekly report tomorrow at 10:35 a.m. in Washington. Oil ministers from the 13-nation Organization of Petroleum Exporting Countries are scheduled to meet on Nov. 29 in Cairo. Slowing global demand growth has left a 1 million-barrel-a-day oversupply that needs to be removed by the end of the year, Venezuela’s oil minister, Rafael Ramirez, said on Nov. 23. OPEC will hold another summit on Dec. 17 in Algeria. Russia may coordinate oil production cuts with OPEC as the world’s second-largest crude exporter reels from falling energy prices. The country can’t rule out cutting output together with OPEC, Energy Minister Sergei Shmatko said at a conference in New Delhi today. Brent crude oil for January settlement dropped $3.58, or 6.6 percent, to settle at $50.35 a barrel on London’s ICE Futures Europe exchange. KUALA LUMPUR: Palm oil makers in Malaysia, the world’s second-largest producer, urged the government to promote burning the edible oil for energy after initial proposals to reduce output failed to stop prices falling. Malaysian manufacturers, electricity producers and companies with power plants should burn 500,000 tons of palm oil a year to cut stockpiles, Dato' Azhar, head of plantations at Sime Darby Bhd, the world’s largest grower, said on behalf of the Malaysian Palm Oil Association yesterday. That’s 2.8% of Malaysia’s estimated output next year. The price of palm oil, used mostly in cooking, has continued to fall even after the government last month said it will pay growers to cut down trees to trim production. The price of palm oil and crude oil has tumbled as the worldwide recession curbs trade. “The current drop is too drastic,” Mohd Bakke Salleh, managing director of Felda Holdings Bhd, a government-owned group representing individual growers, told reporters. Lee Oi Hian, chief executive officer of Kuala Lumpur Kepong Bhd (KLK) said the industry needs help following the price decline. The government should help companies cover the cost of burning palm oil to make electricity, said Sabri. The government can use a RM200 million fund allocated for biodiesel for this purpose, he said. Palm oil futures yesterday rose 3% to RM1,503 a tonne in Kuala Lumpur. They reached a record RM4,486 in March. Palm oil has slumped 60% in the past six months. Growers also urged the government to cut the price of fertiliser. The product accounts for half of a plantation company’s production costs of about RM1,200 a ton, said IOI Corp chairman Lee Shin Cheng. Plantation companies are considering various measures including not using fertiliser for the next six months to cut costs unless prices drop further, said Lee. Fertiliser prices have doubled this year, he said. A group of six Malaysian growers, including IOI, Sime Darby and KLK, earlier backed proposals by the government to reduce output. KUALA LUMPUR/BANGKOK, Nov 24 (Reuters) - Malaysia unexpectedly cut interest rates for the first time in more than five years on Monday and Thailand signalled that it was ready to do the same as Asia grappled with fallout of the global financial crisis. Malaysia's central bank cited the recession in the industrialised world and the receding risk of inflation from high commodity prices as the reasons for its 25 basis point cut to 3.25 percent. FCPO February futures contract rise RM28 higher compare toprevious trading session and close at RM1488 with a total 6478 lots traded inthe market. CPO manage to surge up before market closed despite price was seem maintain during market open for trading session. Technically, CPO price manage to breach previous week high at RM1493 levels but only manage to close at RM1488 region. However, we expect CPO price would be temporary bottomed around the support levels at RM1400 and RM1380 regions while looking to challenge the resistances were levels at RM1550 and RM 1600 in the coming trading session. Traders were advice to hold long position in the comingtrading session while being cautious for major retracement. FKLI November contract plunge 18 points lower compare toprevious trading session at 851 with a total of 8849 lots traded in the market. FKLI unexpectedly plunge 18 point lower as profit taking activities occur for most of the regional indices despite Dow Jones surge up during overnight trading session. Technically, FKLI seems starts to retrace afterreach 869; 123.6% Fibonacci projection instead fulfilling our expectation to reach875; 161.8% Fibonacci projection. 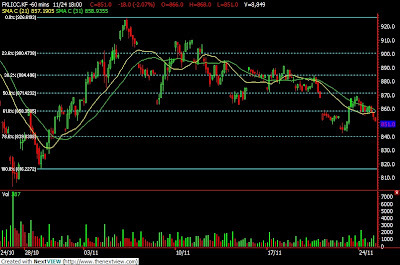 However, FKLI seems to temporary rested on 852.5 regions which is 61.8% Fibonacci retracement levels. Traders were adviceto hold long position in the coming trading session provided if support levelsat 840 and 800 were not violated. 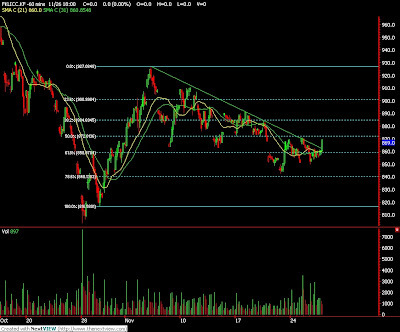 Resistances were seen at 869.5 and 884.5regions. Nov. 24 (Bloomberg) -- The price of palm oil, down 67 percent from a March record, is near the end of its decline because supplies will slow and demand for the edible oil will ride out the global slowdown, Goldman Sachs Group Inc. said. The prices of crude oil and other commodities have tumbled this year on concern the worldwide economic slump will reduce demand. Malaysia and Indonesia, the largest producers of palm oil, are felling oil palms and planting younger saplings to cut output. Palm oil is their biggest agricultural export. The price of the edible oil, based on previous cycles, is mainly driven by supply, Goldman said in today’s report. The replanting will help reduce output, while the yield from plantations is under “stress,” Goldman said. It’s not clear when any rebound will happen, according to the report. Palm oil, used in cooking and to make biofuels, on March 4 reached a record 4,486 ringgit ($1,236) a metric ton in Malaysia, home to growers such as IOI Corp. and Sime Darby Bhd. The commodity today rose as much as 2.3 percent to 1,493 ringgit and traded at 1,478 ringgit at 10:55 a.m. local time. Still, Goldman cut its price forecast for palm oil for the next two years by between 41 percent and 50 percent, joining analysts at CLSA Asia Pacific-Markets and UBS AG. Goldman cuts its rating on Sime Darby, the world’s largest producer of palm oil, and Kuala Lumpur Kepong Bhd., Malaysia’s third-biggest grower, to “sell,” citing “near-term risks” to prices of the commodity. Sime, which has halved in the past year, gained as much as 2.4 percent to 6 ringgit, and traded at 5.9 ringgit at 11:09 a.m. Kuala Lumpur Kepong stock rose 3.1 percent to 8.25 ringgit. Palm oil will probably fetch 1,000 ringgit a ton in 2009, and 1,250 ringgit in 2010, analysts at CLSA said in a Nov. 14 report. UBS on Nov. 6 cuts its price forecast for 2009 by 31 percent to $450 a ton. FCPO February futures contract retrace marginally RM8 lower compare to previous trading session and close at RM1460 with a total 7721 lots traded in the market. CPO was again opened lower as crude oil and soybean oil was traded lower during overnight trading session. Technically, CPO price seem bottomed around RM1380 levels despite support levels RM1400 being challenge during morning trading session and manage to forms Doji in the weekly chart. Traders were advice to hold long position ONLY if resistance levels at RM1493 and RM1550 were being violated. Supports were seen at RM1440 and RM1380 region. FKLI November contract rose 14.5 points higher compare to previous trading session at 869 with a total of 7756 lots traded in the market. FKLI was opened lower as Dow Jones plunge during overnight trading session but starts to surge later trading session as regional indices starts to perform well together with Dow Jones futures electronic trading. Technically, FKLI breaks down from a descending triangle where neckline was seen at 863 levels but seems temporary supported at 840 levels; 78.6% Fibonacci retrace figures. Traders were advice to take profit in the coming trading session if FKLI didn’t manage to breach resistance levels at 875 and 885 regions. Supports were seen at 863 and 840 region. Nov. 21 (Bloomberg) -- The dollar recorded a third weekly gain against the euro as a plunge in global stocks increased demand for the safety of U.S. government debt. The yen increased versus the euro, the dollar, the Brazilian real and the Mexican peso this week on speculation investors will sell higher-yielding assets and pay back low-cost loans in Japan’s currency. Japan’s Finance Minister Shoichi Nakagawa said today “abrupt movements” in stocks and currencies are undesirable. The dollar traded at $1.2582 per euro at 4:17 p.m. in New York, gaining 0.2 percent from $1.2605 on Nov. 14. The yen was at 95.94 versus the dollar, up 1.2 percent from 97.14. It traded at 120.61 against the euro, increasing 1.5 percent this week from 122.39. The ICE’s Dollar Index, which tracks the greenback against the euro, the yen, the pound, the Canadian dollar, the Swiss franc and Sweden’s krona, rose to 88.463 today, the highest level since April 2006. It posted its third weekly gain. Nov. 21 (Bloomberg) -- Gold climbed, capping the biggest weekly gain since September, as the global economic slump dragged down asset prices and boosted the appeal of the precious metal as a store of value. Silver and platinum also rose. Gold was the biggest gainer today, followed by silver, among 19 commodities on the Reuters/Jefferies CRB Index. As recessions grip the U.S., Japan and parts of Europe, central banks may be forced to lower interest rates and pump more liquidity into the financial system, devaluing their currencies, analysts said. Nov. 21 (Bloomberg) -- Crude oil rose for the first time in six days as OPEC members cut production and governments step up efforts to revive economic growth. The Organization of Petroleum Exporting Counties will trim supplies by 3.8 percent this month as members implement an October agreement, according to consultant PetroLogistics Ltd. The group will meet next week to discuss further reductions. The Bank of Japan said today it will consider pumping more money into the financial system.